I was born at Kitakami City in Iwate Prefecture on February 15, 1980. I was crazy about fishing in my boyhood.I didn’t actually care about music, though my father loves music and has always listened to mostly jazz at home. One day just having a look at my father’s Epiphone archtop guitar, I unintentionally held the guitar in my hands and picked strings. Instantly, the timbre deeply touched my heart. Since then my dream for making archtop guitars with my own hands was getting bigger. Soon after finishing senior high school, I studied at ESP Guitar Craft Academy in Tokyo for two years. I eagerly desired to go to the US in order to learn various technical skills, and I enrolled in The Roberto-Venn School of Luthier, Arizona. After the graduation, I went straight to and knocked on the door of two famous archtop guitar luthiers Mr. Tom Ribbecke and Mr. Tom Celletti, whom I have a great respect for, to ask for becoming their pupil, holding a acoustic guitar I made at The Roberto-Venn School of Luthier firmly in my arms. Fortunately I was granted admission. Then returning to Japan once, I worked for half a year to save money necessary for the living expenses in the US. I spent precious three months learning the guitar-making from Mr. Tom Ribbecke and Mr. Tom Celletti in 2003. I was greatly impressed there with having direct experience on how the world’s first-class archtop guitars were made. Soon after coming back home, I went up to Hokaido, a northern island of Japan, because I have been interested in wood of Hokkaido since a long time ago. I worked hard there for two years and saved up money as the fund for opening my own studio.In 2006, I had a fortunate chance meeting with Wassamu Town in Hokkaido and they kindly allowed me to rent a building of the former Seiwa elementary school. I opened my own studio Odashima Guitars. My long-cherished desire came true. 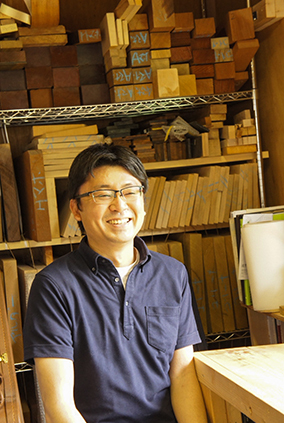 In 2013, the studio Odashima Guitars moved to Tono City in Iwate Prefecture which is close to Kitakami City. I certainly do finishing work of an adhesion surface of tone wood with an edged tool such as a chisel, a plane, etc. And I also certainly use hide glue for gluing tone wood. In 2013 I adopted shellac painting which can be finished with extremely thin paint film, thoughtaking time and labor. These are my commitment to quality. When you have an inquiry such as the price, the time of delivery, the specification and others about our guitars, would you please to mail fill out the inquiry form and send to us.